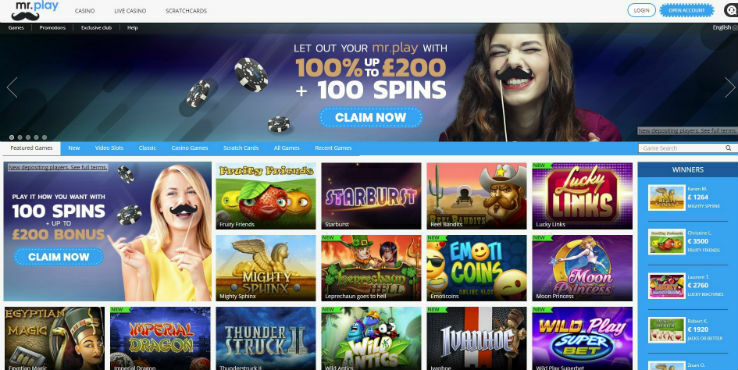 Mr Play has all the qualities needed to thrive in the competitive online casino industry, despite being one of its newest members. With the backing of top software developers and a lot of attention paid to their clients, this casino is a safe place to gamble online. It has generous bonuses that can be cleared easily and promotions guaranteed to keep players happy and motivated to persevere. Mr Play took the gambling industry by storm, as a new casino with high expectations and the resources to back up these ambitious plans. First announced by Aspire Global, it quickly enlisted the services of leading software developers and built an impressive collection of games that meet the expectations of the most demanding players. They’ve got generous bonuses for newcomers and veteran players, while providing several alternatives for cashing out these winnings. A user-friendly website and professional client support makes players feel right at home. If you think that an online gambling operator is only as good as the games it offers, Mr Play games will surely sweep you off your feet. The sheer number of the slots as well as the diversity of titles provided by a long list of software developers charm newcomers and keep existing players happy. Players will be welcomed by an eclectic mix of classic slots such as Twin Spin, Jack and the Beanstalk, Gonzo’s Quest, Mega Fortune, Starburst and Wild Wild West and more modern titles. Making the transition from regular Mr Play slots to those carrying progressive jackpots requires a single click. Millions of dollars are up for grabs and with several Mr Play jackpots to choose from, players can focus on the best paying ones. The casino clearly displays the amount that can be won for each jackpot in real-time, so players know when the prize has been reset. Mrplay free spins are routinely offered and players can also use these bonus rounds to chase the elusive millionaire makers. Mr Play slots might be the most numerous of all the games available here, but other genres are also featured. This is a great place to be if you are in the market for live dealer casino games, especially roulette and blackjack. The European, French and American roulette versions can be played against real croupiers who are fluent in English and have a friendly demeanor. Blackjack fans are just as lucky, to be able to sit down at live Atlantic City blackjack and multi-hand blackjack tables. Mr play scratch cards have their own section and this happens to be one of the fastest growing area, with new titles being added. There are fewer options for video poker fans at Mr Play, but at least the classic games are available. Players can take the hands-on approach when spinning the reels of Deuces Wild, Jack or Better and Joker Poker, or they can use the autoplay feature. Anyone can sign up for an account and play all the games available on virtual currency. However, those who are ready to make a deposit will also be eligible for the generous Mr Play welcome bonus. There’s a lot of money on the table, with new customers being eligible for as much as £200 and 100 free spins. The first deposit will be doubled and the bonus rounds awarded incrementally, in chunks of 20 at a time. In order to unlock the maximum number of free spins, one would have to make subsequent deposits. Mr Play free spins as well as the welcome bonus are subject to wagering requirements before cash outs are permitted. The good news is that it’s pretty easy to withdraw the winnings by making these play through demands in a couple of days. 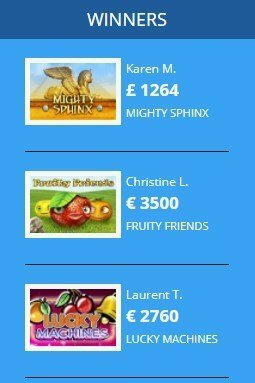 All games qualify for clearing the Mr Play bonus and there are also plenty of slots where free spins can be used. Players are only expected to make a deposit of at least £10 and spin the combined amount through 35 times before the bonus expires. Online casino Mr Play promotions have the merit of keeping players going, by providing them with frequent incentives. Perhaps the most important one is also the most durable of all campaigns, taking players through several levels. At the end of the climb, players can attain VIP status and unlock exclusive Mr Play bonuses and perks. Everyone is automatically enrolled for this program the moment they sign up for an account, make the first deposit and start playing the games. Rewards get progressively better and players don’t even have to wait until they climb to the highest step to receive these bonuses. They will be showered with free spins, unlock cash bonuses and other special prizes, which grew bigger as they move up the leaderboard. The most successful players will have their own VIP manager that will look after them 24/7. This will make it easier for them to stay in the loop with the latest Mr Play promotions and take full advantage of the casino’s generosity. Those who enjoy Mr Play games on a daily basis will have the chance to win an all paid vacation this Christmas. Holiday season starts sooner this year and the most active players will quickly climbed the leaderboard to secure the ultimate payout. Mr Play’s Holiday Prizes will be distributed among many lucky players, so everyone has a decent chance at winning something. Mr Play payment methods now include more than a dozen different financial instruments ranging from credit and debit cards to electronic wallets and wire transfers. MasterCard, Visa and Maestro cards as well as prepaid ones from PaySafeCards can be used for deposits. Players also have the option of loading their account and cashing out winnings via Skrill, Neteller, EPS and Sofort. The casino doesn’t charge any commission and there are no hidden fees eating away at the players profits. A careful reading of this Mr Play casino review will highlight the fact that the gambling operator doesn’t limit the freedom of its customers. Instead it provides them with the opportunity to choose between different games produced by different developers. 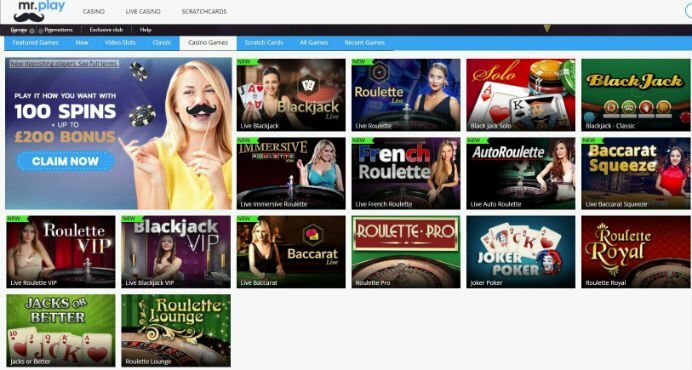 Betsoft, Elk Studios, Novomatic, Playtech, Play’n Go, NetEnt, Quickspin, Yggdrasil, iSoftBet and NextGen enjoy a great reputation online. Their games are featured by leading casinos, because of the great graphics, high payouts and mobile friendly nature. Mr Play casino has all the information encrypted, so there’s no way cyber criminals can feel the sensitive data of their members. At the same time, players can trust the independent auditors who monitor all the games offered to ensure their fairness. When it comes to payment processing, all transactions are processed by the company licensed in Malta and called Aspire Global International. The list of the most successful players at Mr Play casino is updated every week. This provides members with the perfect incentive to be active and play their games on real cash to move up the ladder. The casino doesn’t disclose personal information about the players and only the nicknames and initials are used. By doing so, their privacy is protected and players are kept up to date with the achievements of their peers. The registration process at Mr Play consists of only two steps and takes less than one minute. New members need to press the "open account" button at the top of the page. Then choose a username, a valid email address and a password that contains both letters and numbers. Next the new members will be expected to enter their name, birthday date and currency of choice as well as their country of origin and a phone number. This is all it takes to open a new account and it will grant players access to all the bonuses and games they offer. Overall, Mr Play is a highly enjoyable and fun casino that provides a top quality gaming experience. The variety of payment methods is exactly what you would have expected of a truly great casino. The registration is very simple, so you will not need to waste any time figuring out how to get your welcome bonus. Mr Play is a safe and reliable casino with attentive support, and a vision to bring its players only the best the industry has to offer. As a member of the VegasMaster writing staff, I pride myself on delivering quality information about my favorite topic: the online gaming industry. In addition to playing a wide-variety of online casino games, I keep up on the latest iGaming news and trends. My passion for the industry has made me both an experienced player and researcher.